The first Asia Pro Qualifier in Taiwan. We are proud to invite IFBB PRO superstar Dennis James to participate in this event with us. 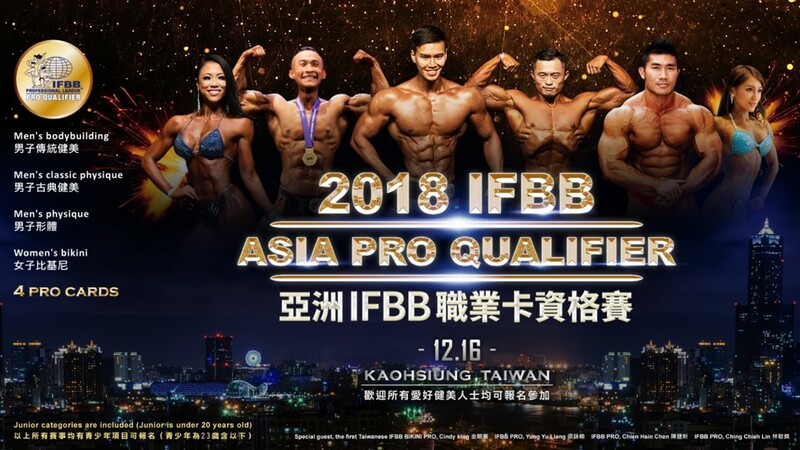 Taiwanese IFBB PRO, Chien-Hsin Chen, Yung-Yu Liang, Cindy Kim, Ching-Chieh Lin will also participate. There are total 4 IFBB PRO cards include Men's Bodybuilding, Men's Classic Physique, Men's Physique, Women's Bikini for the show. Five international judges and director of Mr. Olympia- Robin Chang will host this special event. IFBB BIKINI PRO Cindy Kim will be our guest poser, and IFBB PHYSIQUE PRO from China Wu Long will be our special guest. We welcome all the fitness/bodybuilding fans to join us.